Material documents may survive because of deliberate attempts at preservation, as when the St Cuthbert Gospel was placed in Cuthbert’s coffin in the 7th century and kept company with the saint’s body for hundreds of years. Or they may survive fortuitously – buried in a peat bog, for example, as happened to the Fadden More Psalter or the Springmount Bog Tablets. Often the margin between survival and destruction was thin. The Exeter Book, which contains the only known copies of a very sizeable proportion of the extant Old English poetic corpus, survived being used as a chopping block and beer mat, and escaped conflagration when someone dropped a piece of burning wood on it. And, speaking of conflagration, any student of medieval English literature must shudder when remembering the infamous Ashburnham House fire (that was the name of the place, I’m not making it up) that scorched Sir Robert Cotton’s collection in 1731, destroying some manuscripts and damaging others – most famously the Beowulf manuscript, Cotton Vitellius A.xv, which got rather crispy round the edges. The best way of preserving data, of course, is to reproduce it. 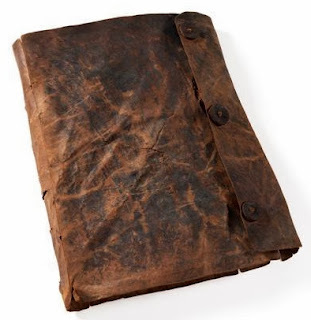 The St Cuthbert Gospel, the Fadden More Psalter, and the Springmount Bog Tablets all preserve parts of the Vulgate Bible. Arguably, if any of these documents had been completely lost, instead of being just taken out of circulation for centuries, there were enough other copies out there (not to mention the great swathes of text, especially the Psalter, that devoted clerics memorised) so that survival of the text of the Vulgate Bible was not seriously threatened, even if individual manuscripts might be dropped in bogs, shredded by Vikings, or burned up in house fires. But the Bible has such a robust textual tradition because it is the foundational text of Christianity, and so has been considered intrinsically valuable: it was copied thousands of times, especially in translation, through the Middle Ages. Secular texts had a much more tenuous chance of survival during that same period. The four masterpieces of British Library MS Cotton Nero A.x are known only from that one manuscript; if it had been destroyed in the Ashburnham House fire, we would have lost not just an old book but those two great English poems, Pearl and Sir Gawain and the Green Knight. What gets reproduced, most often, is not the document but the data. The manuscript copy of the Old English Rune Poem was destroyed by the Ashburnham House fire, but the poem is preserved in the transcription made by Humfrey Wanley for George Hickes’ Thesaurus (1705). However, since we don’t have the original manuscript any more, or even a photographic facsimile, we don’t know how faithful Hickes or Wanley were to the text in the manuscript, let alone to its layout or other visual features. In the process of transcription and editing, information was doubtless lost, changed, and added. People concerned with digital preservation will recognise this as an issue that recurs in using data migration as a preservation strategy. Someone still needs to make decisions about what counts as information, and what counts as information valuable enough to preserve, in order to reproduce it in a new format. 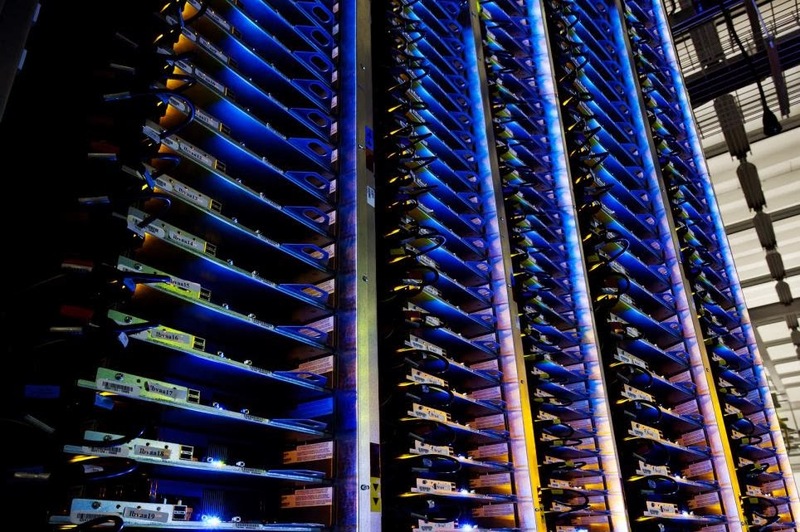 Inside the Google data center in Council Bluffs, Iowa. Image: Daily Mail. And the fact remains that information, if it is to be accessible and useable through time, has to exist in some kind of material environment, whether a piece of parchment in a peat bog, or a server farm in Iowa. In a digital age where we are perhaps most apt to fall into the illusion that information somehow exists in a ‘virtual’, non-material cyberspace, we are nevertheless paying increased scholarly attention to the materiality of information. If the British Library blew up, and its collections were destroyed, the loss to humanity would be incalculable. If someone somehow managed to drop bombs simultaneously on all of Google’s data centres around the globe, the world would lose these blog posts, which would be a much, much more trivial loss. But in any scenario in which that might happen, I would probably be concerned with more urgent kinds of survival. The image of the Fadden More Psalter is from the National Museum of Ireland, 'Focus on the Fadden More Psalter' (2013). 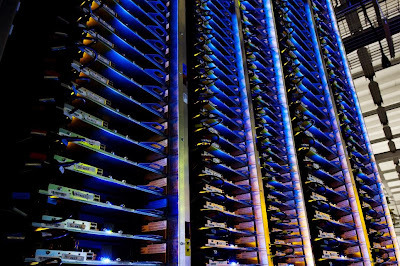 The image of the Google server farm in Iowa is from Mark Prigg, 'Inside the Internet,' Daily Mail Online, 19 October 2012, where there are lots more fascinating pictures. The standard scholarly edition of the Old English Rune Poem is Maureen Halsall, ed. and trans., The Old English Rune Poem: A Critical Edition (Toronto: U of Toronto P, 1981). See also the discussion in R. I. Page, An Introduction to English Runes, 2nd ed. (Woodbridge: Boydell P, 1999) 63-76. The latest edition of the Exeter Book is Bernard Muir, ed., The Exeter Anthology of Old English Poetry, 2nd ed. (Exeter: U of Exeter P, 2006), print and DVD.